When it comes to fueling adventure in and around Corpus Christi, there aren’t many vehicles that can come close to besting the new Jeep Wrangler. The reviewers at the U.S. News are among the many who have praised this SUV’s “Herculean off-road ability,” durable, well-made interior, and available cargo space in the Unlimited model. Explore our lineup of new Jeep Wrangler models, and then schedule a test drive in your favorite. Why Choose a New Jeep Wrangler from Allen Samuels CDJR Aransas Pass? 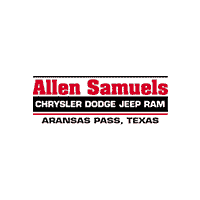 With the Allen Samuels CDJR Aransas Pass advantage, there’s no reason to wait. If you like what you see in our lineup of new Wrangler models, then schedule a test drive in your favorite, today! Once you’ve cruised out past Port Lavaca in the Wrangler of your choice, you won’t be able to settle for any other SUV. Contact us today to get started.